I don't think that Disney's writers take Star Wars' universe very seriously. I'm not talking about story or continuity; I'm talking about the actual, physical space in which the stories take place. They've created a major problem. It's the same problem that frustrated me about The Force Awakens: there is no sense of scale to this universe anymore. I was really hoping that it was just J.J. Abrams and his writing crew being lazy in Force Awakens because his Star Trek movies suffered from the same problem. I had hoped that a new writing crew would improve the material (just like Star Trek Beyond fixed another of my biggest complaints about the reboots of that franchise after J.J. left the helm). But that laziness seems to not only be contagious, but has actually gotten worse in Rogue One. This movie takes something that was only a nagging annoyance in Force Awakens, and blows it up to almost movie-breaking proportions. In the original Star Wars movies, the time-frames for hyperspace travel was always ambiguous. There were cuts between scenes, and the amount of time that it took for ships to travel was left to the individual viewer's imagination. But now, we see interstellar travel and communications happen instantaneously, in real time! It happens when the fighter crashes on Eado, and the rebel base on Yavin immediately loses contact and sends a squad of fighters to assault the base. 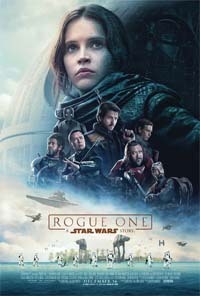 It happens again when Rogue One infiltrates the Imperial data warehouse on Scarif, a transmission is intercepted, and a rebel fleet immediately gets rerouted to the planet. This isn't just bad science; it's also bad writing. The hyperdrive has become a narrative crutch. For the entire second half of the movie, I felt no tension at all because I knew that if the heroes ever got in a jam, a rebel fleet (or reinforcements) could just appear out of nowhere to save the day. This is a prequel, so I already knew how it was going to end. This lazy script contrivance (and all-around dull characters) also made the journey to get there completely uninteresting. But it goes deeper. How far apart are these places? Is the entire galaxy that accessible? Basic elements of the overarching Star Wars storyline just completely break down when travel and communication is instantaneous. There's no distinction between the tightly-controlled "core", and the supposedly-lawless "outter rim" planets if a whole fleet of Star Destroyers can literally FTL to any planet in a matter of seconds. There's no need for anyone to make a hard-copy of the Death Star plans to physically transport it if they can transmit the data instantly. And there's no point in pursuing or intercepting ships (such as Leia's Blockade Runner) if hyperspace travel takes the ship to its destination in a mere moment. The empire's holdings become completely indefensible if entire rebel fleets can appear out of nowhere with no warning. Their installations are publicly visible, but the rebels are hidden. The rebels know where all the imperial bases are, and there's nothing stopping them from just jumping to random bases and blowing them up with no recourse from the empire. This universe has lost the believable, lived-in quality and sense of breadth and variety that the original trilogy so expertly executed. The Star Wars universe is broken. Rogue One shows us instantaneous communication and travel between planets in real time. "Just turn off your brain and enjoy it", people tell me. No. I won't turn off my brain. There is no reason why our movies can't be both entertaining and smartly-written. Why aren't we holding our movies to that standard anymore? It's not a tall bar. "Not as bad as the prequels" is not good enough, and I'm not going to pretend that it is when dealing with entries of a series that contains - not one - but two - landmark cinematic masterpieces. Even if every new movie were as likable as The Force Awakens, these little missteps add up. Each new movie that comes out chips away at the integrity of the franchise (and universe) in which all the movies (including the good ones) exist. We can hand-wave away our complaints about the prequels, or we can ignore them entirely, but we're now at the point at which the original Star Wars trilogy is a minority of the Star Wars film franchise, and it's only getting more diluted.